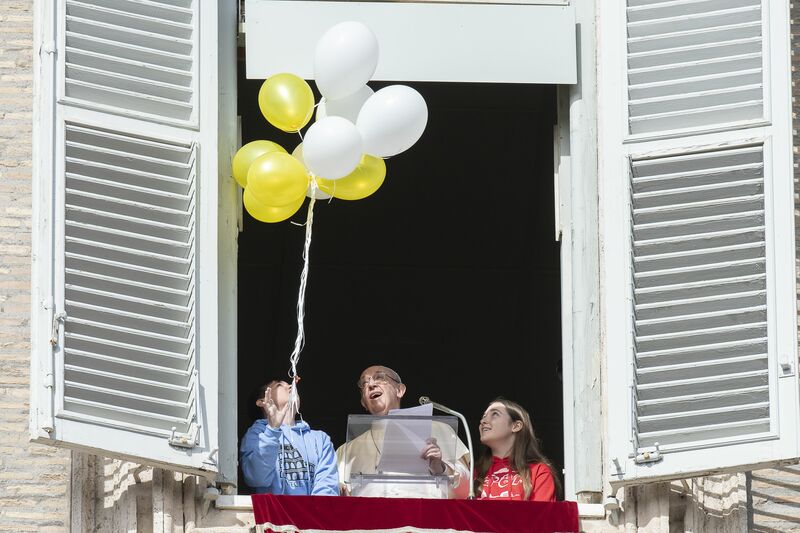 Pope Francis on February 3, 2019, greeted the young members of Catholic Action of the Diocese, read a statement of peace (accompanied by a couple youthful helpers), and joined them in a joyful balloon launch. All this occurred after the Holy Father prayed the noonday Angelus with the faithful in St. Peter’s Square. “I greet affectionately the boys and girls of Catholic Action of the Diocese of Rome,” the Pope said. “Dear youngsters, I’m happy to receive you, together with the Cardinal Vicar, the assistant priests, your parent, and educators, at the end of the ‘Caravan of Peace.’ With this initiative you open the celebrations for the 150 years of the foundation of Catholic Action of Rome, and the 50 years of the birth of the ACR. I hope you will be joyful witnesses of peace and fraternity. Now we listen together to the message that your friends, next to me here, will read to us. This year also, we youngster of CAR, together with our friends, our educators and our priests, have turned to you, to say to the whole world loudly and clearly that we want Peace! If it was not understood well, we repeat: We want Peace!!! To be more precise, we have discovered that Peace is truly a good thing, also tasty! It gives flavour to our relationships and does good to our heart, which becomes healthier and more genuine! Peace is somewhat like salt: if there isn’t any, everything loses its taste and only a little of it is enough to adjust the plate! So today we can say that even if there are difficult situations between us and in the world, it’s not necessary to get discouraged or to turn the other way! It’s necessary to contribute some action of Peace that, perhaps, won’t resolve all the problems, but will surely give more flavour to this world! We also want to do our part: so, with the funds that we collected, we support the project “We have rice for something serious,” which helps the poor areas of the world to guarantee the value of food and the rights of those that produce it, so that all can have a just recompense for their work and live fittingly! Dear Pope, we are also here to celebrate with you two important accomplishments: the first is that Catholic Action of Rome celebrates this year its first 150 years in our beautiful city! We ask you, our Bishop, for a prayer so that we won’t tire to proclaim the Gospel! The second is that the Youngsters’ Catholic Action is celebrating 50 years but, as you see, we wear it very well! For half a century we youngsters have sought to enrich our association with our presence and our commitment to tell how beautiful it is to encounter Jesus! Please remember CAR in your prayers! Thank you, truly, Pope Francis, for your enormous commitment to have us encounter Jesus and to follow Him in our life! It seems that you never tire, and now we won’t tire either to say to all that we want Peace! Yes: we want Peace! CAR of Rome that loves you so much!